This new cookbook is the child of Food52, a truly inspiring, vibrant, and uniquely interactive online community of home cooks curated by food veterans, Amanda Hesser and Merrill Stubbs. That's just a sampling, there are far too many good ones to list them all here. 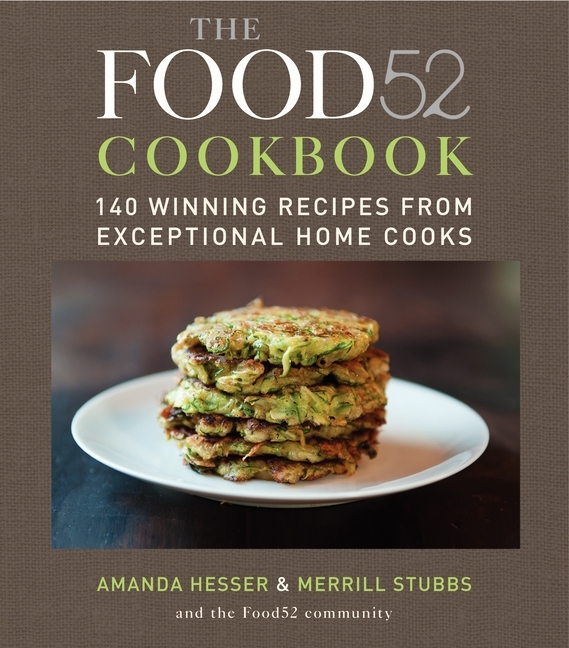 In addition to these 140 winningest recipes, you also get Amanda and Merrill's helpful comments on each recipe, as well as lots of behind the scenes photos, tips and variations. So without further ado, I'm giving away one copy of The Food52 Cookbook. Comments must be received by Friday, November 4th. I will choose a winner at random (using random.org) and will announce the winner here, on Facebook and on Twitter on November 7th and will email the winner to get her or his mailing address. Thanks to the good folks at William Morrow/Harper Collins for providing me with a copy of this luscious book. sounds delicious, Janet. But don't forget to leave me a way to get in touch with you. Otherwise, I can't enter you in the giveaway and that would be a shame. My new signature dish (is it a signature dish if it's new?) is bulgur burgers from one of the Moosewood cookbooks. So. Good. My signature dish is stuffed french toast. Everyone that has ever had it asks for the recipe. Fried Chicken properly done in a cast iron skillet. I don't make it often because the oil is expensive and it always makes a greasy mess in the kitchen; but the chicken is NOT greasy, when done correctly, but moist. Left overs are even great cold for a picnic or a hike. My hubby's favorite though is my spaghetti sauce with a burn. @ Chris, I'd love to learn how to make a pie crust from you! I experimented Monday by adding flax meal and wheat germ to the crust for a pumpkin pie. It came out okay, with a bit of a nutty flavor, but I'm still working on making pie crusts flaky. Perfection has eluded my pie crusts....lol. My signature dish is my mexican casserole!! My signature dish is pasta- many many different ways :) My favorite would be a vodka sauce with ricotta and wilted spinach with a poached egg nestled on top. My signature dish is bread pudding! So it's a signature dessert! I guess my signature dish is one I make often and successfully so it must be the stuffed vegetables the greek way... Tomatoes, paprikas, eggplants stuffed with rice, herbs, spices and tomato sauce. Perfect summer food that gets better the second day and the day after along with a piece of feta cheese! I'm sort of locally famous for my soups: a creamy tomato and basil with sherry, and a ham and cabbage soup that is to die for. Didn't know about Food52 till just now. So excited! rachel at greencreative dot net. I make a warm clam dip that everyone asks me to bring to parties. Also, an outrageously decadent cheesecake. My signature dish is a Spinach Souffle. My mother taught me how to make souffle when I was about 14 - (well she taught me how to make a white sauce first and after that the rest is child's play). I use a nice tasty cheddar, frozen spinach and don't forget the nutmeg. Served with a simple salad it's an impressive little supper to whip up at a moment's notice. You can reach me at jsg51@yahoo.com. PS - I love your blog - so happy to have discovered it. chili! my family loves it. Overnight Chinese 5-spice pork shoulder. You wake up in the morning to a house that smells like heaven! Camarones en Chipotle de Crema. Seasoned shrimp in a cream chipotle sauce with a dollop of white rice seasoned with cilantro and radishes. It's a dish I had a restaurant that took me two years to replicate, but I did it. Complement with chips and home made salsa verde, mostly because chips and salsa go with anything, imho. Finish with Crepes Cajeta. Mexican crepes covered in cajeta sauce (caramelized goats milk) and topped off with a scoop of dulce ice cream and sprinkled with sliced almonds. Happy to share recipes with anyone. Mandy. www.facebook.com/mandyoneill. PA Dutch Apple Crisp from Grandma Clark is one of my most often requested recipes. It has a sweet dough on top instead of crumb topping as most do.